When foundation shifts and settles, your property’s concrete slabs can be compromised, causing cracks and uneven surfaces. 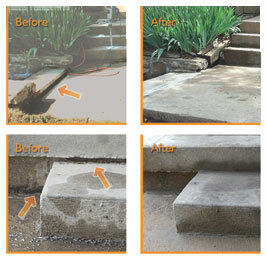 Unlevel concrete can be both hazardous and unsightly, which is why most home and business owners choose to make repairs sooner rather than later. Rather than pouring new concrete, which can be a time-consuming and expensive endeavor, we recommend concrete leveling. Our preferred method of concrete leveling is mudjacking, a process used to level, raise, and fill voids under the concrete. Why does concrete sinking occur? Mudjacking involves drilling holes in the damaged concrete and filling them with “mud,” a mixture often composed of cement and sand. This mixture fills the voids between the concrete and soil, which in turn lifts the concrete surface. Once the slab is raised to the desired height, the holes are plugged with a shrink-proof mixture. You might have heard mudjacking called other popular terms, such as concrete lifting, slabjacking, and concrete raising, but all have the same goal of concrete leveling. Why is Mudjacking the Preferred Method for Concrete Leveling? Mudjacking is our preference for concrete leveling because it’s a cost-effective alternative to tearing out and replacing sunken concrete slabs and other concrete repair methods. It is completed in just a few hours, requiring less equipment and manpower than newly poured concrete slabs. Not only that, it’s minimally disturbing to the surrounding areas, meaning less mess and potential damage. Once the mixture is cured and the process is complete, you’ll be able to use your concrete immediately with trip hazards gone and the peace of mind knowing that your concrete repair will last for years to come. What types of concrete leveling can mudjacking accomplish? Contact Foundation 1 today to set up an appointment to have a free evaluation at your home! Click here to view photos of recent mudjacking jobs by Foundation 1.